Routine is habit’s little sister, the one that doesn’t get all the press. It’s the small, daily activities that we do that either give us peace or create chaos. In many ways, our routine can make or break us. Is it our routine to get up early and putter around the house, maybe do some journaling or chores? 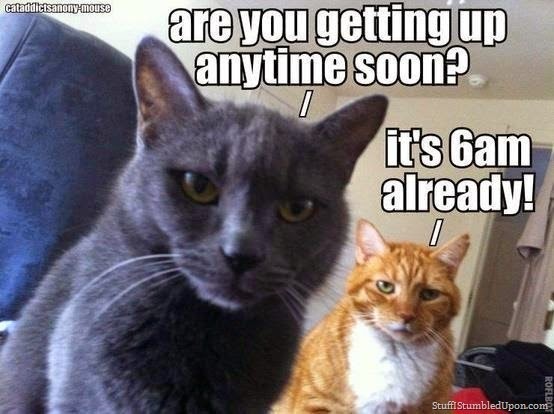 Or is it our routine to hit the “snooze” button until the last possible moment, only to careen out of the house with toothpaste on our chin, barely ready for the day? It’s worth considering whether our routines are leading us in the direction we want them to or, instead, hindering our best-laid plans. The nice thing about routine is that it doesn’t have any drama around it. It just is. We do it because it’s our routine, because that’s what we do at a particular time or day. Morning pages, for example, become a routine. We don’t write them because we’re a writer, and not even because we should write them; we write them because it’s our routine to write them in the morning. What’s more, when we break our routine, we feel disjointed and out of sorts. Routine, then, can help keep us on track. So how do we use routine to make the life we want? We first have to decide what we want in our lives, yes? That’s sometimes easier said than done. Let’s start smaller. What do we want to include in our lives that we’re not yet doing? Maybe it’s writing our journal or morning pages on a daily basis, or going to the gym. Maybe it’s picking up what we put down and preventing clutter from accumulating. Pick one thing. Now, do that one thing, just because you do it. Not because it’s Going To Lead To Big Things, and not even because It’s What We Want To Do. Just do it because it’s a routine, because it’s something we do at a particular time and place. So tell me, Dear Reader: what’s your one thing? Previous PostPrevious Sunday Journal – Why Cats?